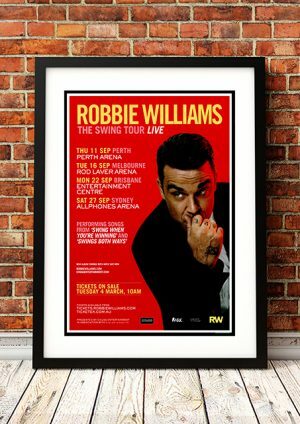 Classic Robbie Williams Band Concert Posters and Memorabilia! Buy Online Now! 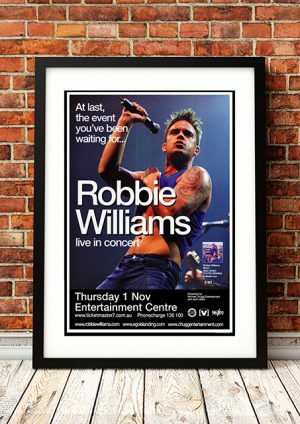 Out of all the members of Take That, Robbie Williams never really seemed to fit in. Roguishly handsome where his bandmates were merely cute, Williams was tougher and sexier than the rest, which made him more distinctive. He also fought regularly with the other members and their management, primarily because he was occasionally averse to being so heavily packaged. So it didn’t come as a surprise that he was the first to leave the band, departing early in the summer of 1995 to pursue a solo career (by some accounts, he was fired from the group). Although he was the first out of the gate, it took Williams a while to get started. For most of 1995, he attempted to boost his credibility by tagging along with Oasis, hoping that Noel Gallagher would give him a couple of songs. He never did, but all of his time with Oasis launched Williams into a world of heavy partying, drinking, and drugging. Over the course of 1996, he was only heard from in gossip columns, and every published picture indicated he had put on considerable weight. Released late in 1996, the single was a disaster, but his second single, 1997’s “Old Before I Die,” was more in the vein of his early pronouncements, featuring a distinct Oasis influence. We stock some awesome Robbie Williams Band Concert Posters.